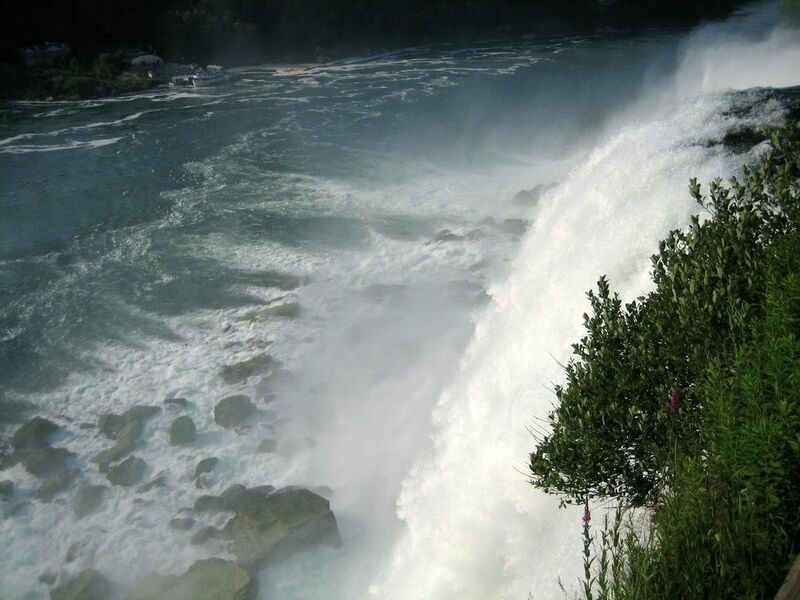 Niagara Falls is just a 3-hour drive away from Cleveland. 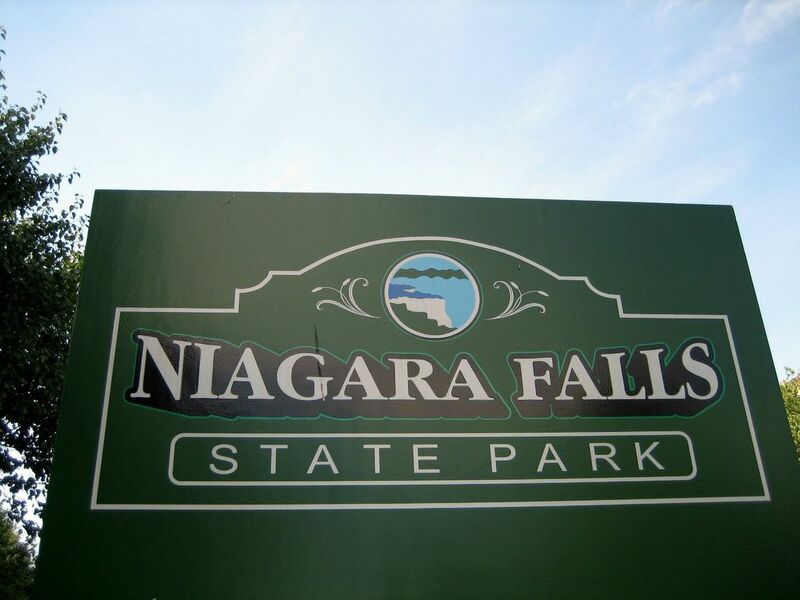 Niagara Falls State Park. 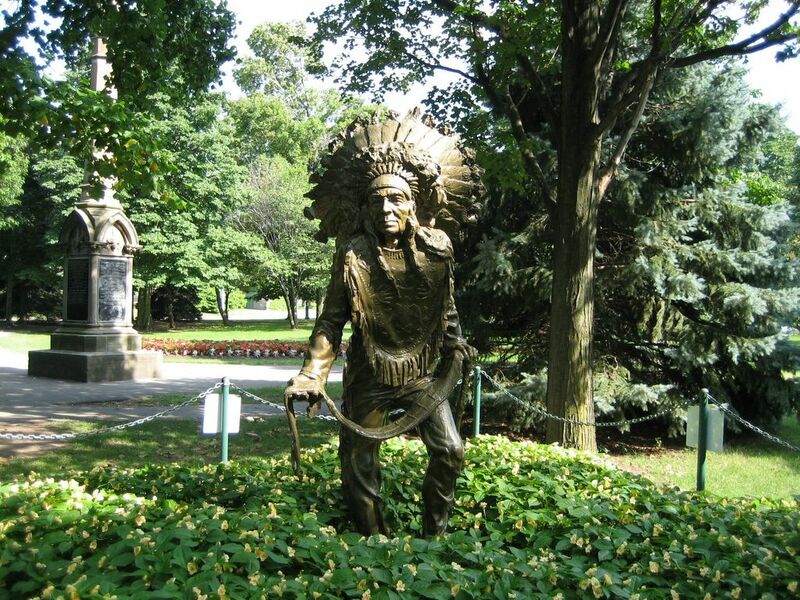 A statue of a Native American chief on the American side of the falls. 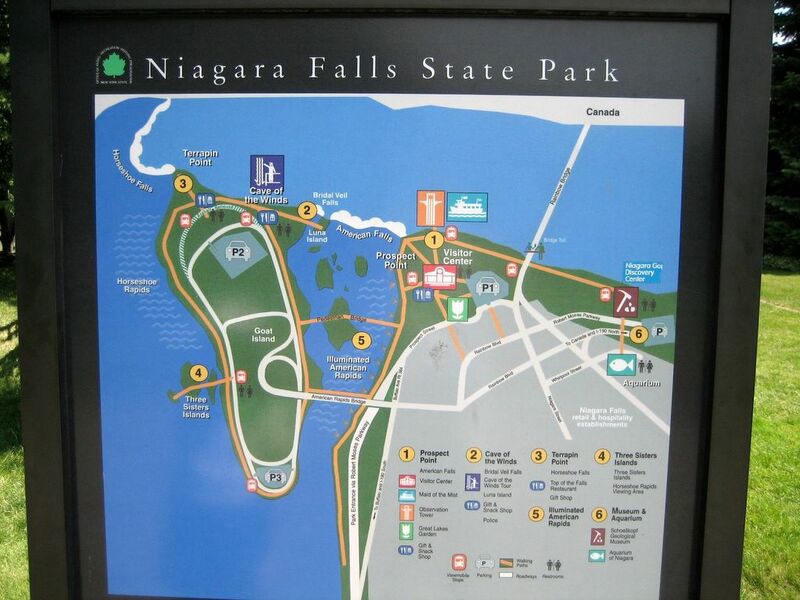 A map of Niagara Falls park. 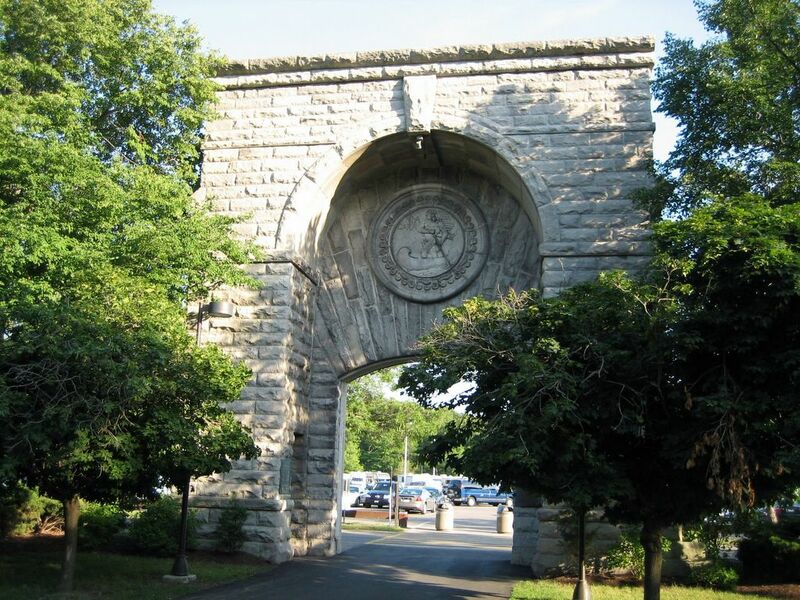 The bridge to Goat Island. 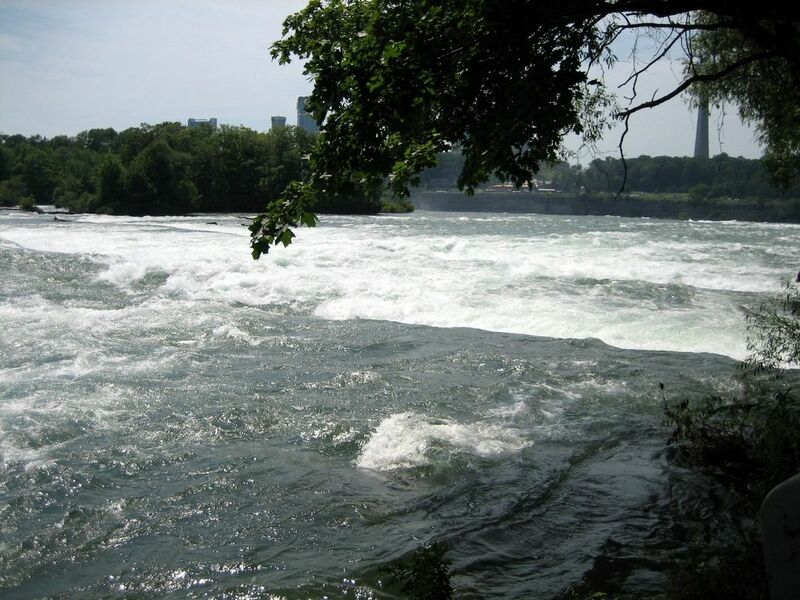 The white water here is called "the point of no return" since a boat takes less than 3 minutes to reach the falls from this spot. 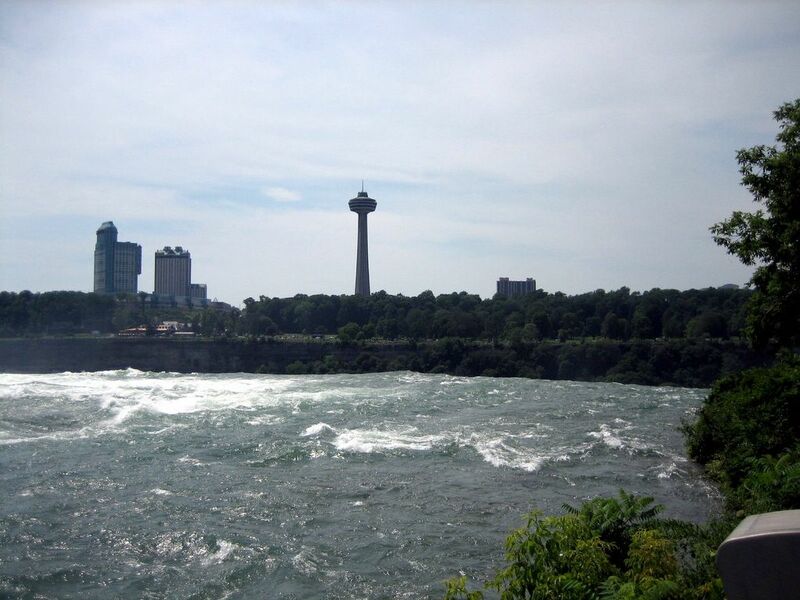 This is the Canadian side on the other side of the Niagara River with the observation tower and hotels. 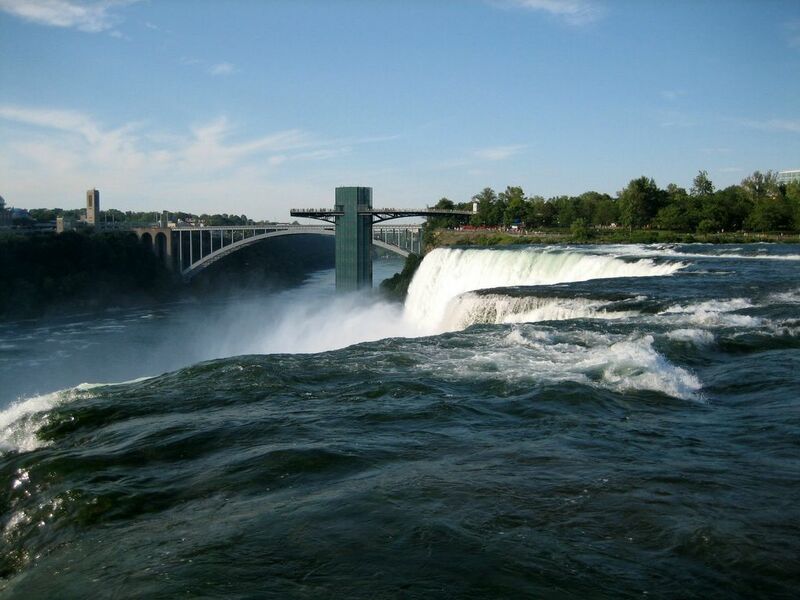 A view at the American Falls from the American side. 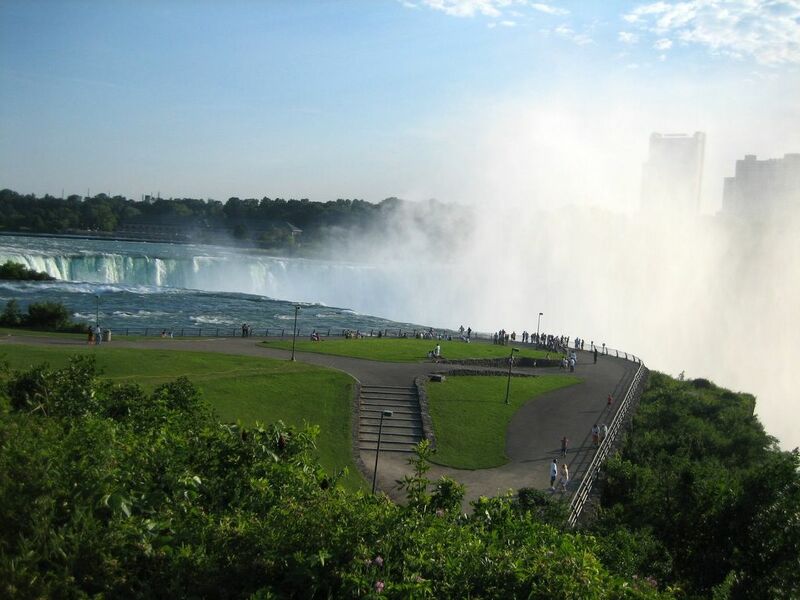 The Horseshoe Falls are seen in the distance. Goat Island is at the top left of the picture. 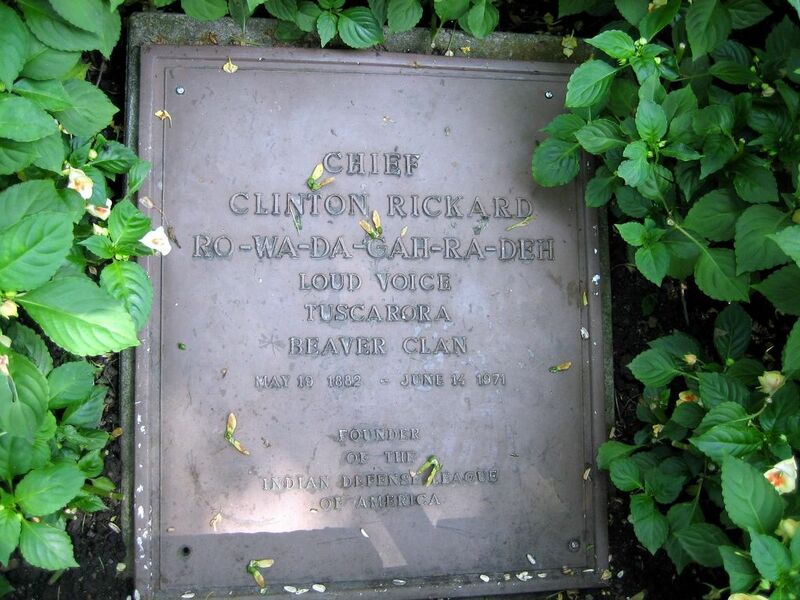 Canadian side is on the right. You can see the Maid of the Mist boats right of the center of the picture. 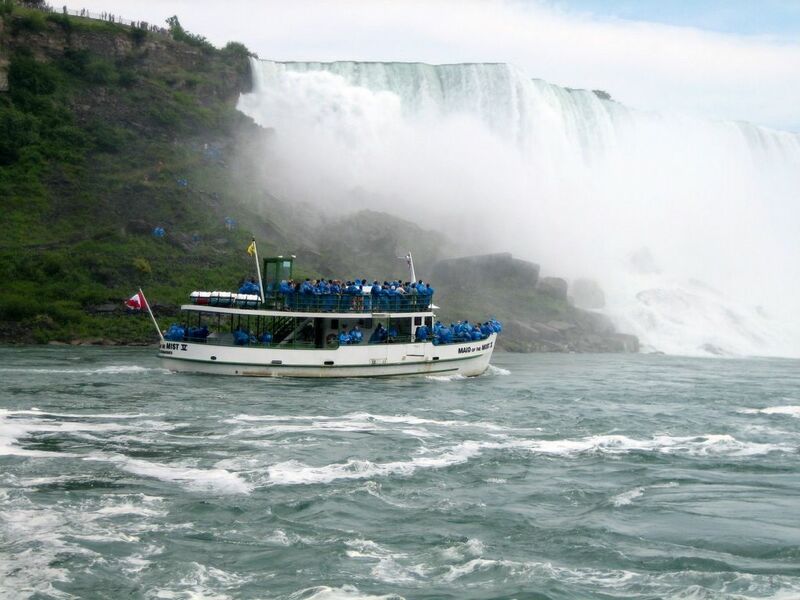 The boats go very close to the Horseshoe Falls to the point where the "mist" is actually a pouring rain. That is why you get a free blue raincoat with each Maid of the Mist ticket. 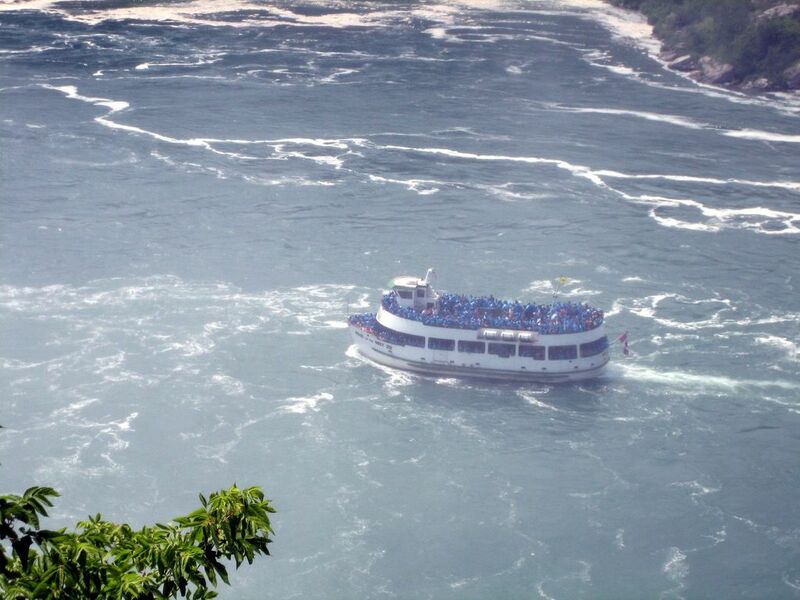 This is a Maid of the Mist boat, everybody on board is wearing their blue raincoats. Since your shoes are not covered by the raincoat, they will get really wet, so plan accordingly. 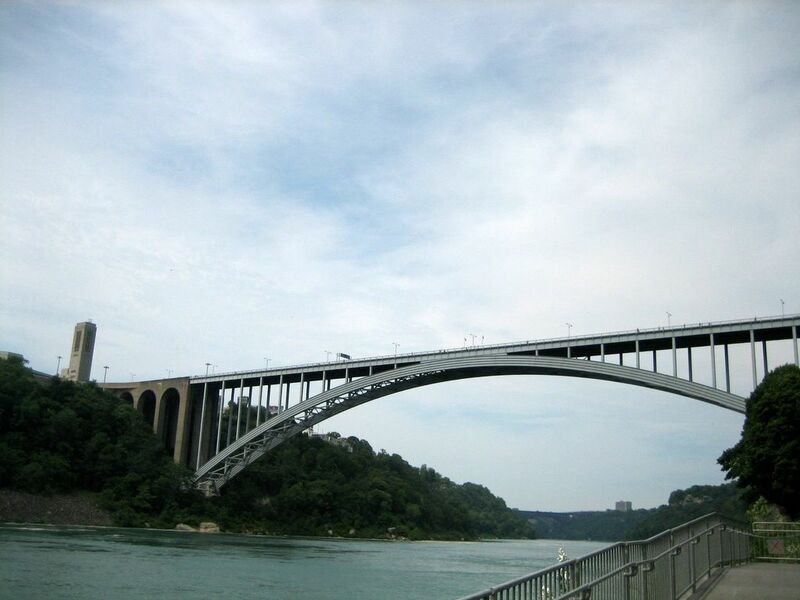 The Rainbow Bridge connect the American side (on the right) to the Canadian side (on the left). The Maid of Mist boarding deck is just below the bridge. 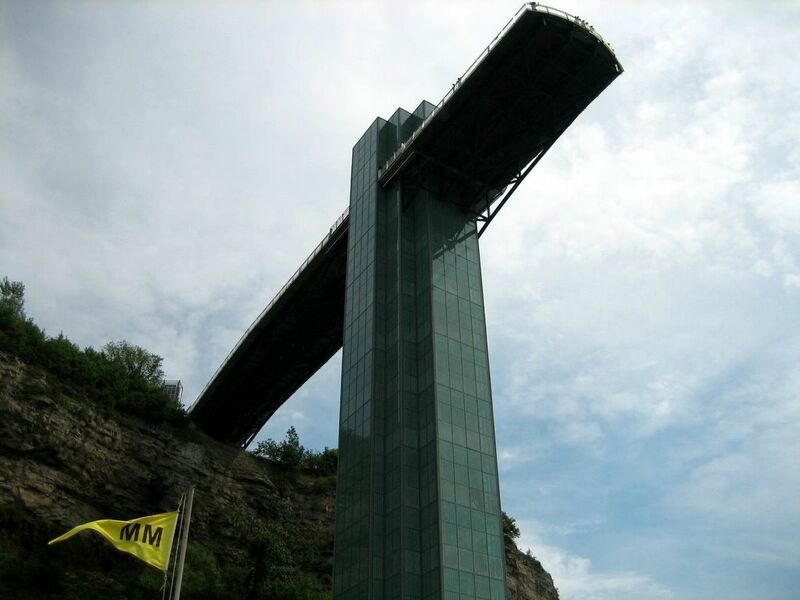 This is a view from the Maid of the Mist boarding platform, you can see the yellow "MM" flag. 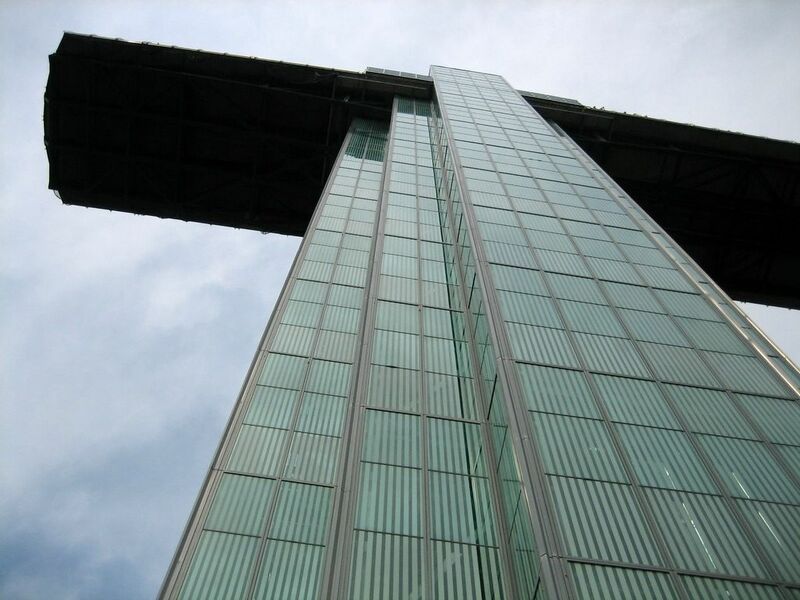 The structure above is the observation deck with the elevators to the ground level where you board the boat. 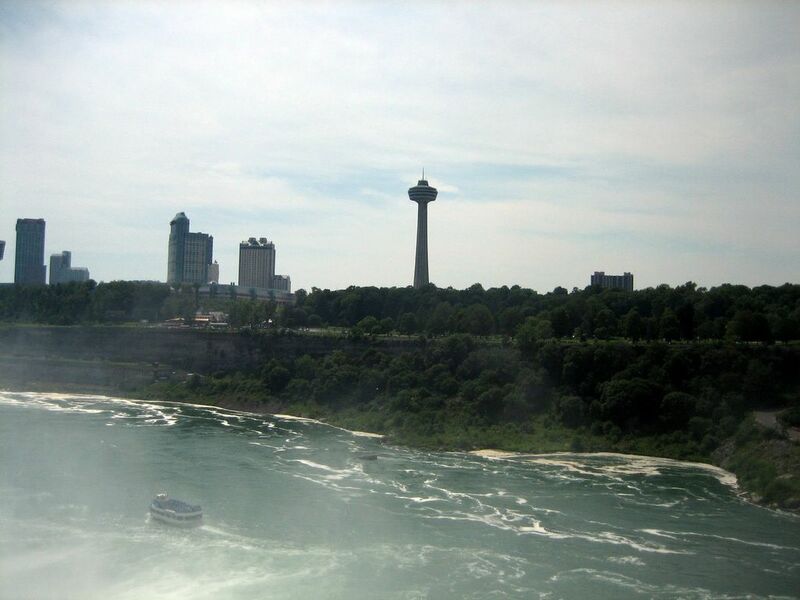 A view at the American Falls from the Maid of the Mist boat. You can see the full width of the falls from this angle. 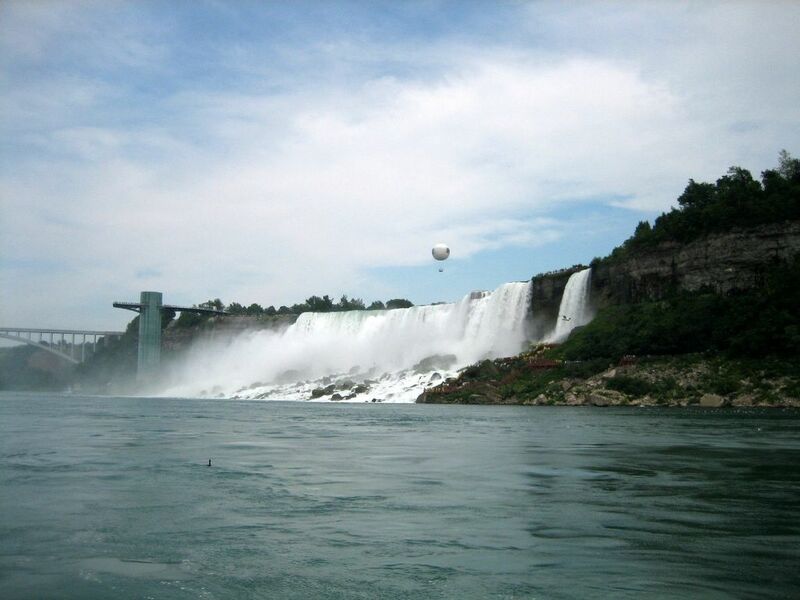 The view from the land does not do justice to the enormous scale of the falls. 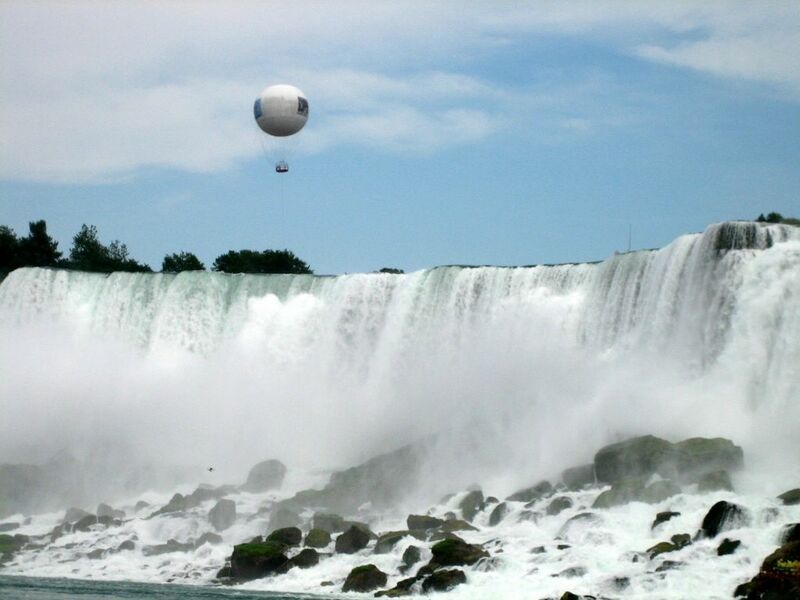 There is an observation balloon just above the falls in this photo. 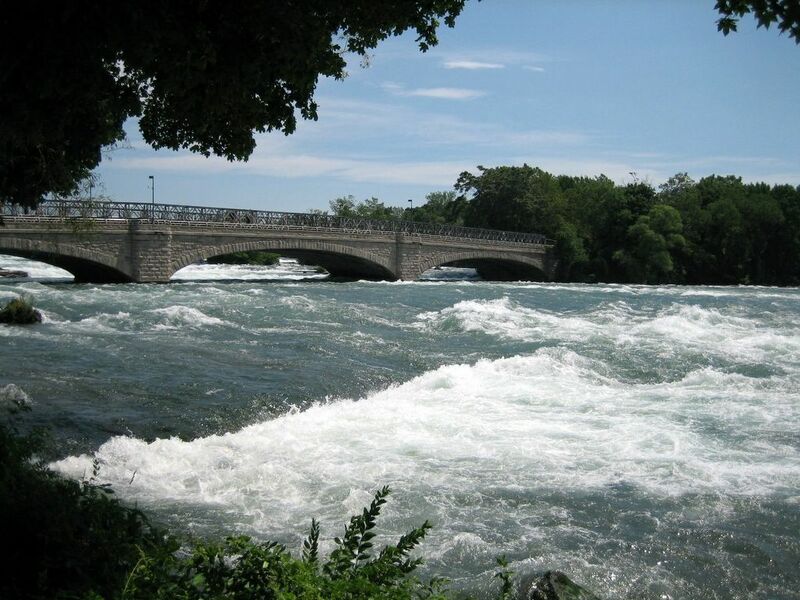 There are actually 3 Niagara Falls: American Falls (seen here on the left), the small Bridal Veil Falls between Goat Island and the American Falls (seen on the right), and the huge Horseshoe Falls (not seen in this photo). 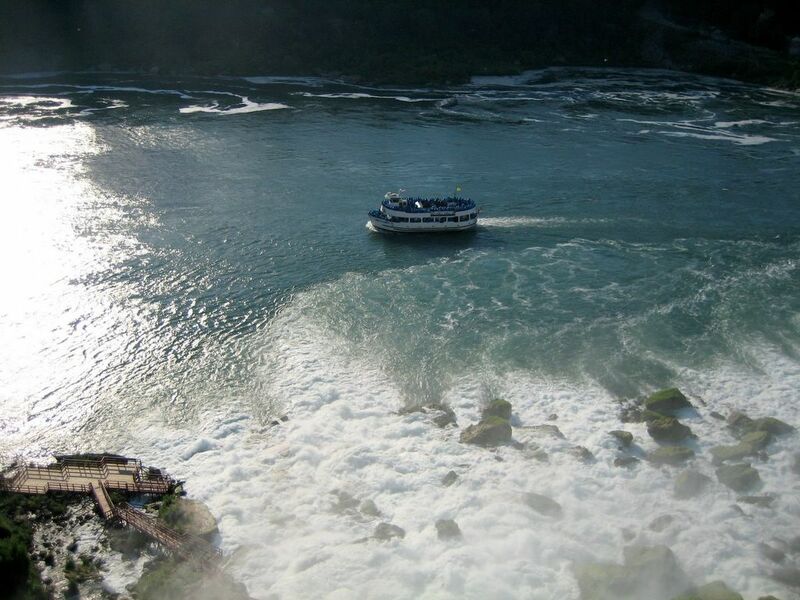 The Maid of the Mist boat is heading straight into the roaring falls. 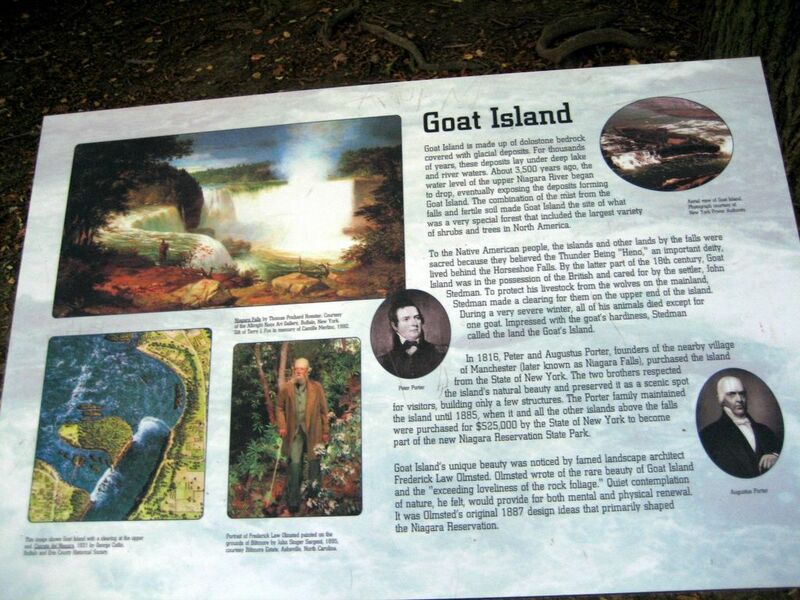 Goat Island got its name from John Stedman, an early pioneer and miller, who kept a herd of animals on the island. The animals all died in the terrible winter of 1780, but one stubborn male goat survived and gave the island its name. 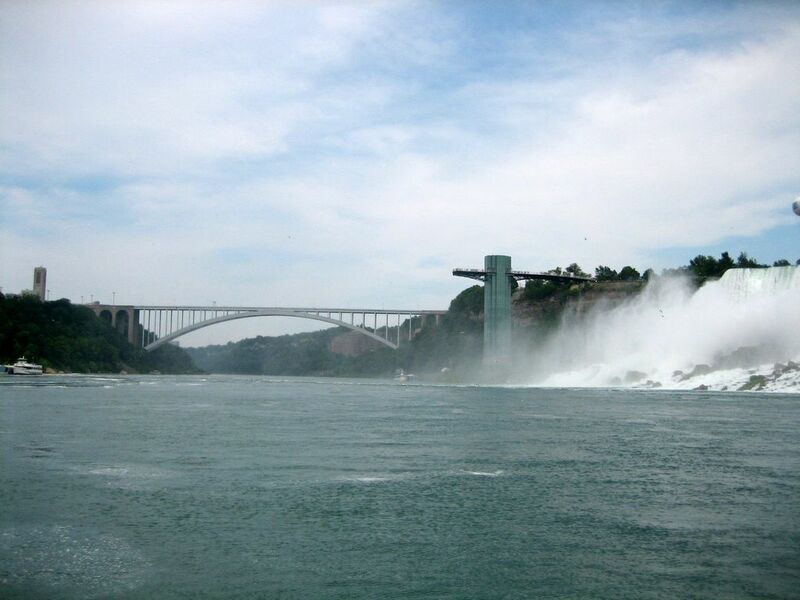 This is a view of the American Falls, the observation deck and the Rainbow Bridge from the Goat Island. 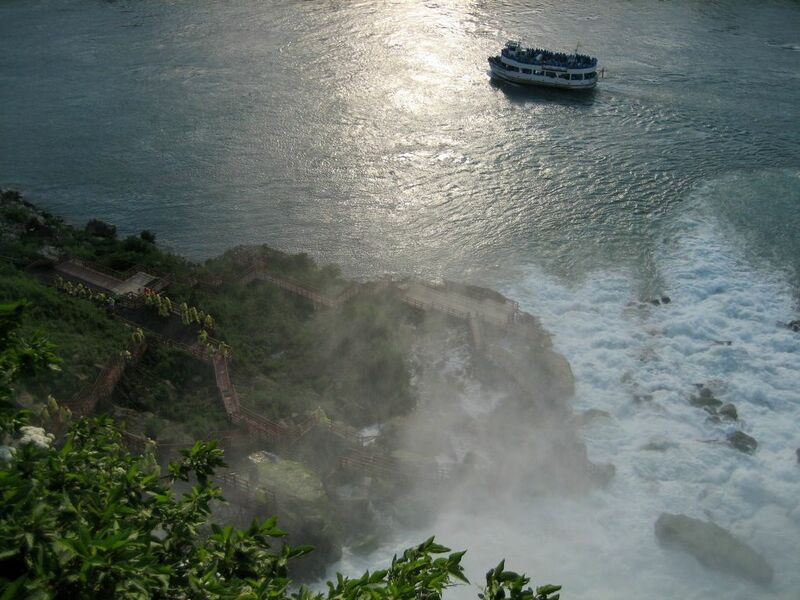 The observation platform in the bottom left corner of the photo is part of the Cave of the Winds attraction. This is Bridal Veil Falls, as seen from Goat Island. Another view of the Cave of the Winds platform at the bottom of the Bridal Veil falls at Goat Island. 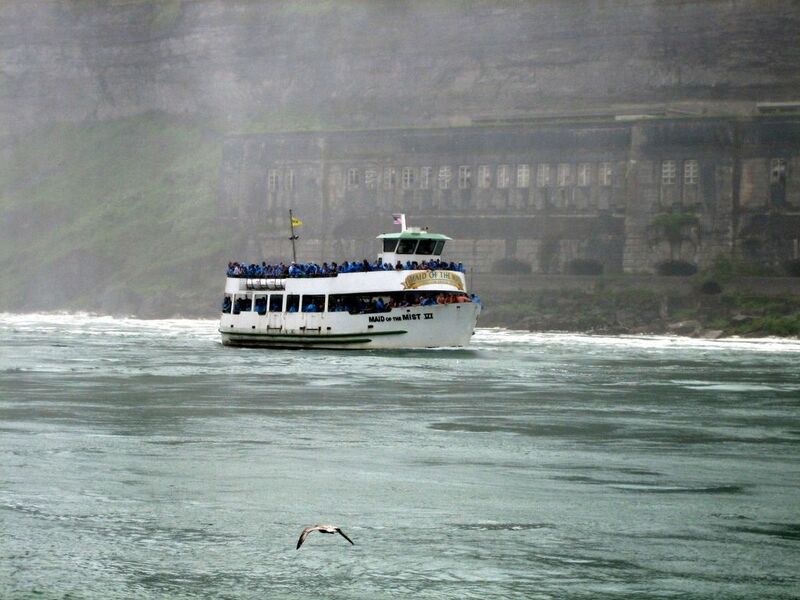 Note that tourists who go to the Cave of the Winds wear yellow raincoats while those boarding the Maid of the Mist wear blue raincoats (the boat is seen in the top corner of the photo). 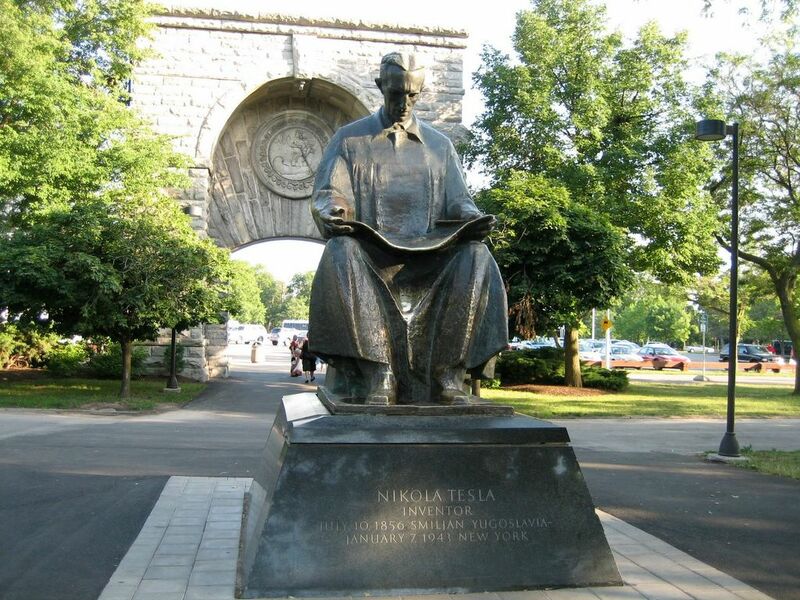 The statue of Nicola Tesla on Goat Island. Tesla pioneered modern electrical engineering and many of his discoveries were of groundbreaking importance. 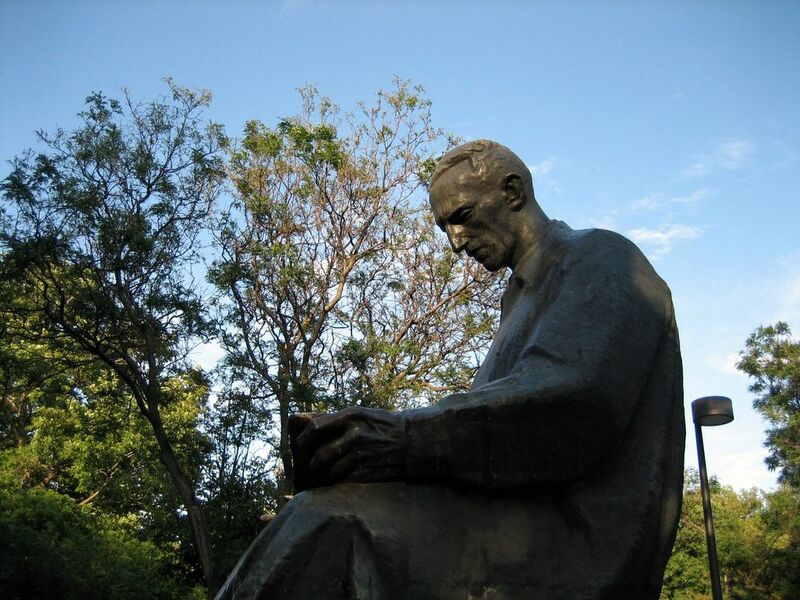 Never putting much focus on his finances, Tesla died impoverished and forgotten at the age of 86 (source: Wikipedia). 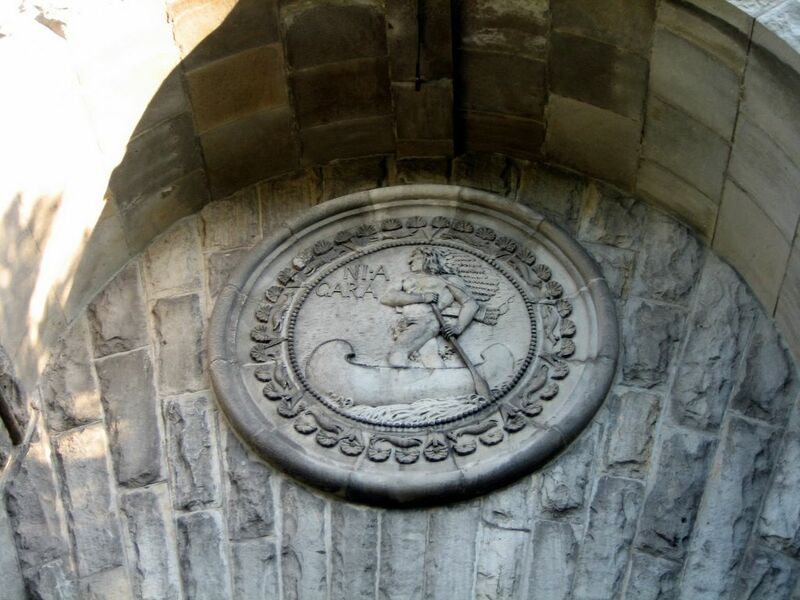 The arch entrance to the world's first hydroelectric power plant. 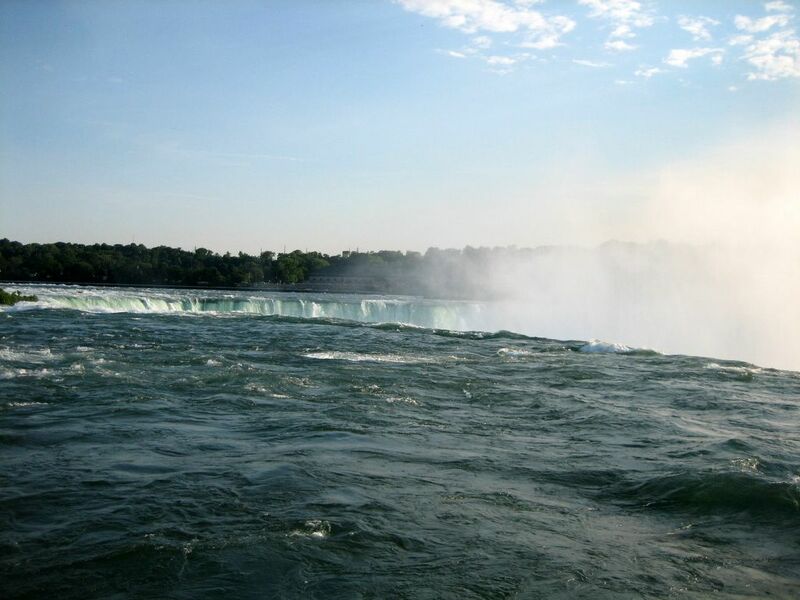 A view at the Horseshoe Falls from Goat Island. The view from the Canadian side (not shown) is much more beautiful. 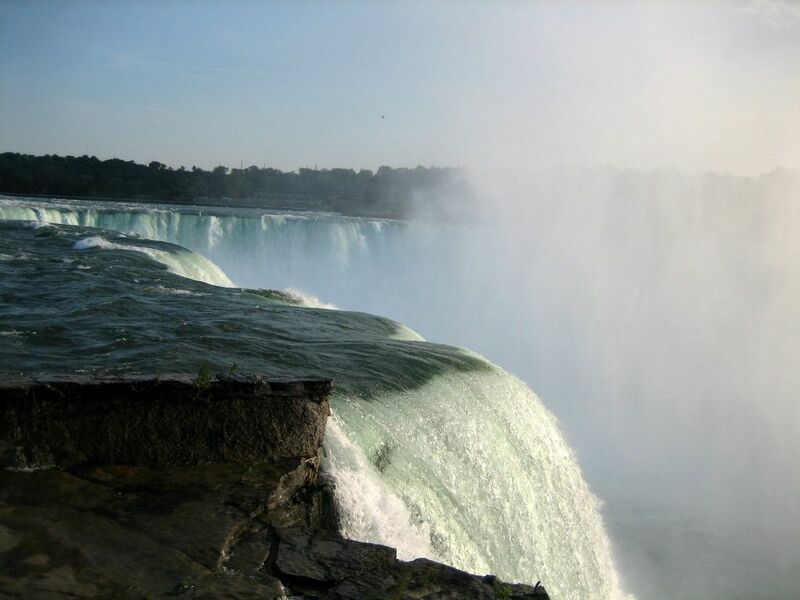 I went to Niagara Falls several years ago and I have to say it was one of the greatest sights I have ever seen. You can't describe it, you just have to see it. It worth going over the bridge to view it from the Canadian side too. I'd love to go back but am too far away ( England).